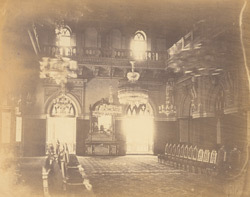 Photograph of the durbar hall in the palace at Bhuj, Gujarat, taken by an unknown photographer during the late 1870s. The hall is part of the Prag Mahal, a Victorian palace built in c.1865 by Rao Pragmalji, (ruled 1860-1875) to the Venetian Gothic designs of Colonel Henry St Clair Wilkins (1828-1896). The hall measured eighty feet by forty, and was forty feet high. The design and decoration of the interior was originally intended to be Gothic, but was changed to an Italianate style. It has arched windows and doors with pilasters and marble columns in between and a viewing gallery at the upper level supported by caryatids. It was hung with chandeliers and given an opulent finish with gilding, figured plate glass in the windows, and a ceiling decorated with cupids and painted allegorical scenes.